Margaret TomasDoes this photo give you chills? Follow the tips below for hiking on ice and you can skip the goosebumps. Sometimes, warm is worse when hiking on ice. Greg Maino won’t forget one mild winter day, when melting ice made for a treacherous hike up Hunger Mountain in Vermont’s Worcester Range north of Montpelier. Maino, an experienced Vermont hiker and skiier, and his friends, all of whom were new to the area, struggled over slippery and exposed rock slabs as they approached the open mountain summit. “We kept thinking it would get better and pushed higher and higher, but eventually we had to come back down, which was super sketchy,” he says of the harrowing experience. Winter weather is becoming more variable, says Emily Davenport, an AMC outdoor guide based at Pinkham Notch Visitor Center in New Hampshire. “Thawing can happen any time, but in recent years, we are seeing interesting January and February thaws that didn’t used to happen,” she says. If the warming is significant enough, it can make for tricky hiking conditions, including unstable, icy trails and dangerous water crossings. As a guide who brings people of all experience levels outside in all seasons, including winter, Davenport has a few suggestions for safely traveling over melting ice. Before heading out on trails that could be icy, do two things: Get a forecast for the day you’ll be hiking and look back over recent weather patterns. Will the temperatures be below freezing for the whole day? Has there been a significant warming period recently? Answering these questions will help you determine whether the ice will be solid and reliable or melting, slippery, and dicey. The right footwear can keep hikers safe on icy trails. Traction devices, such as MICROspikes, are the best option for hiking below treeline. Above treeline, where the ice is thicker, crampons are key. With both types, be sure to stomp your feet when walking on melting ice. Even with traction devices, hikers can slip around easily. Try to dig your feet into the ice as much as possible. 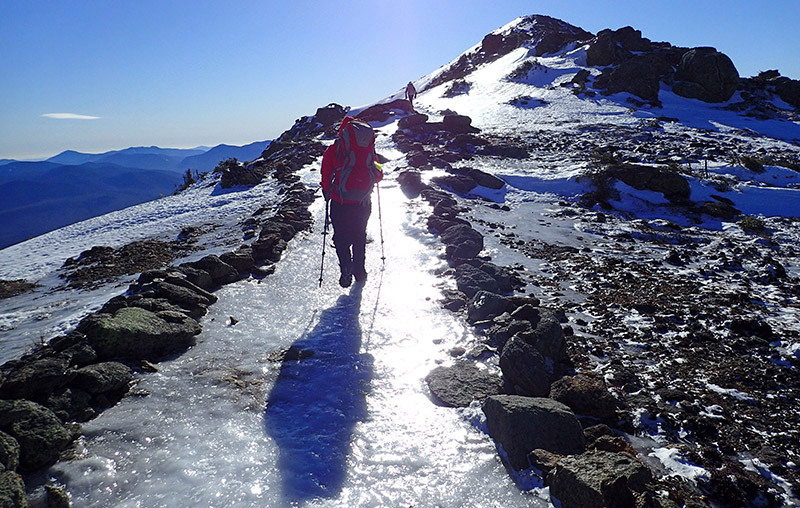 While good for snowy trails, snowshoes do not provide adequate traction for hiking on ice. Trekking poles double as a great method for testing the durability of ice. Tap the ice with your pole before moving forward, gauging how stable the ice is by the sound. A hollow noise is not good and suggests unstable ice on trails. You can also use poles to test for insufficiently frozen ice covering water crossings. At all costs, avoid treading on thin ice that could break through to the water below; hiking wet in winter is a shortcut to hypothermia. On steep or exposed sections, always test your traction on the ice at the bottom of the slope. People sometimes manage to get up a slippery hill but forget they have to come back down. As with the group of friends on Mount Hunger, a descent can be trickier than a climb. If you don’t have appropriate traction to get up and back down, consider turning around. You thought icy trails were tough? Get tips specifically on crossing water in winter. Commit to memory the 5 times you should always turn around while hiking. Browse more advice on traction devices, courtesy of our gear guru. Sarah Galbraith is a backpacker and cyclist who recently started putting the two together on bikepacking trips with her young daughter. She lives in northeastern Vermont.